Norma Jean vocalist Cory Brandan isn't just good at screaming till he chips the paint off the walls with their latest, 'Meridional.' He is actually a single dad who has full custody of his two kids. "I have a 16-year-old daughter, too," Brandan told Noisecreep. "People look at me and go, 'No way!' But yeah, I have a lot of help from their moms. I am not with their moms anymore, but we have fun raising our children together. They live with me, and I have been a single parent for 15 years." Parental responsibilities are certainly tough when your job means that you have to be on the road and away from home for many months of the year while on tour, but Brandan's family has found a way to make it work. "They are with their moms when I tour or with my mom, and they are used to it. They are used to me being in a band and gone sometimes," the singer said. "That is the hardest thing: the time away. Not only that, being gone and knowing that I am gone for five and a half weeks for 30 minutes a day of work, and that hour offstage doing band stuff, too, is hard. When I am sitting around, I miss my kids. It is a weird job in that sense." Brandan's kids have gone on the road with him a bunch, too. "Their first tour was 2005 on Sounds of the Undeground and then they came out with us on Ozzfest for a couple of weeks. In 2008, they came out for a few weeks on Warped Tour," Brandan said. "We get them out on tour. They have a blast and they love it. They would stay on the whole tour if they could." While the kids like touring, they don't necessarily love the racket that dad's band makes. "I don't think they like it," Brandan laughed about his kid's opinions of his music. "My 16-year-old loves MGMT and we went to see them together. When she likes a band, I usually know who it is! But now it is [less certain], where she might like a band and I will be like, 'I dunno who that is!' That's starting the gap." 'Meridional' is out July 13. 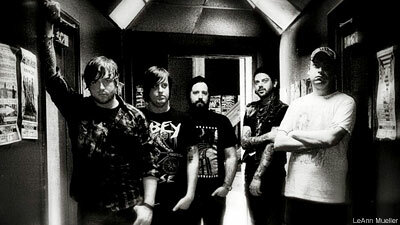 Norma Jean are playing Mayhem Fest all summer.